Letter: Why care about climate change if the Second Coming is nigh? 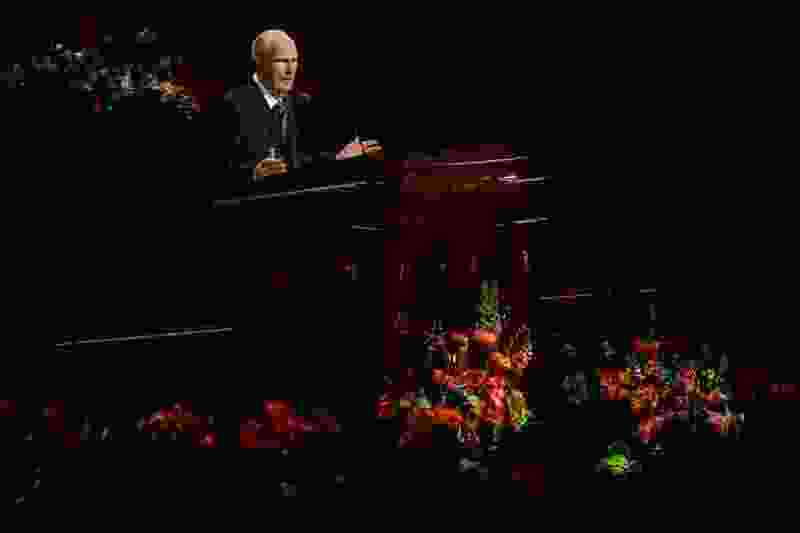 (Trent Nelson | Tribune file photo) President Russell M. Nelson announces new temples during the afternoon session of the189th Annual General Conference of The Church of Jesus Christ of Latter-day Saints in Salt Lake City on Sunday, April 7, 2019. I just read the warning given by Russell M. Nelson, president of The Church of Jesus Christ of Latter-day Saints, that the Second Coming is near. Not only did the warning apply to members who had left the church, it was extended to those of us who had never seriously considered joining it. I’ve always taken exhortations given by religious leaders with a grain of salt. But this time I paid attention. Not that I believe in the proverbial “second coming of Christ,” but because our Earth is under assault by human beings. I’ve often wondered why so many conservative lawmakers, especially here in Utah, deny that climate change is human-caused and not only refuse to take any meaningful measures to slow the damage but also welcome the return of some of the most polluting industries, such as coal. No one seems to care now about seriously cutting car emissions or getting good gas mileage. Making money (lots of it) trumps environmental concerns every time. Even so, one would expect conservatives to care about the future of their children and grandchildren. But now Mr. Nelson and his ilk may have answered this question. Because they believe the end is near, they see no reason to discontinue their path of taking everything the Earth has to offer in disregard to how much destruction it may cause. Why worry about future generations, when they will no longer be around after the Second Coming? How sad for those of us who still feel the Earth is salvageable.